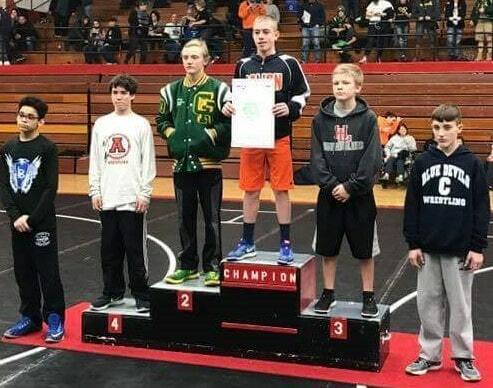 FOSTORIA — Six Galion wrestlers qualified for the district tournament during sectional action Friday and Saturday at Fostoria High School. Two are advancing as district champions: Brenden Ganshorn and Mason Weldon. At 106 pounds, Ganshorn had a first-round bye. He pinned Jackson Smith of Liberty Benton in 45 seconds in the second round, and then, in the semifinals earned a 19-4 technical fall over Jordan Marczak ofArcadia. In the 106-pound finale, Ganshorn earned a 5-2 decision over Owen Karcher from Cory-Rawson. In the 285-pound class, Weldon pinned Mason Greer of Liberty Benton in the first round in 47 seconds. Then he defeated Alan Refugio of Fremont St. Joseph, 4-2. In the semifinals, Weldon beat Matt Smith of McComb 5-1. In the championship bout, he pinned Nick Maur, of Tiffin Calvert, in 31 seconds. Four other Tigers also will continue their seasons next week at the Division III district meet at Toledo Waite High School. Garrett Kuns finished as the runner-up in the 170-pound weight class after losing in the finals to Cole Draper of Mohawk, 5-1. Draper was a state qualifier last season. At 195-pounds, Noah Grochowalski was defeated by eventual runner-up, Brice Markel, from McComb, by a 10-5 decision. After dropping down to the lower bracket, Grochowalski made his way to the third-place match and was victorious over Brent Mullholand of Carey by pinfall, in 1:37, securing his district berth. Cody Brady took fourth place overall in the 126-pound weight class after being pinned in 2:15 by third-place finisher Thane Gallegos of Riverdale. Brady also is headed for the district tournament. In the 160-pound weight class, Matthew Oehrli also snagged a fourth-place finish and will wrestle in Toledo this week. Oehrli was defeated in the third-place match by Jacob Emerine from Van Buren, 17-6. Destiny Yoder of Galion was sixth in the 120-pound weight class. Galion was third in the team standings with 121.5 points, behind Mohawk-179.5 points and 2. Carey-158 points. Arcadia was fourth with 119.5 points; followed by 5. McComb-114.5 points; 6. Van Buren-103.5 points; 7. Bucyrus and Fremont St.Joseph Central Catholic-85 points; 9. Cory-Rawson-81.5 points; 10. Riverdale-76.5 points; 11. Tiffin Calvert-73 points; 12. Liberty-Benton-50 points; 13. Fostoria St.Wendelin-24 points; 14. Hopewell-Loudon-17 points.